One of the primary goals of this book is to demonstrate that the "stories" in the Torah are not merely one-time occurrences, temporal incidents undergone by individuals long ago. Rather these "stories" are archetypal in nature, representing various physical and spiritual energies ever-present in all aspects of reality and within each and every person.In addition, this book demonstrates that each word, verse, and mitzvah in the torah can be simultaneously understood on many different levels, so that the torah speaks to all people at all times. 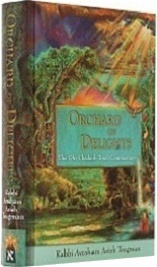 "Orchard of Delights" attempts at every juncture to translate the underlying meaning of the Torah into contemporary language, bridging secular knowledge and Torah wisdom. There is no end to the depth of the Torah, no limit to her spiritual delights. From the rational to the mystical, the ancient to the contemporary, her secrets are many.